I’ve taken the liberty of focussing on love in general for my picture books on Valentine’s Day. That’s not to say I eschew romance – not at all! But working as a primary school librarian, Valentines are more likely passed from friend to friend or child to family member or even to pet, and this is what these three picture books celebrate. In the so-called current trend for uplit (literature that’s uplifting for the soul), this picture book fits lovingly into the zeitgeist. Edwyn blows a kiss to his grandma, shown on the cover as a gold foil sprinkle of stars, like dandelion seeds released into the wind. 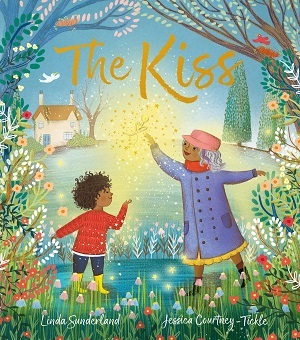 Edwyn’s grandma shares her received kiss, almost as an act of kindness, bestowing it upon those who need it most, such as a sad old man and a cross mother. But then darkness descends in the shape of a man who steals it and wants to keep the kiss for himself, all locked up as an artefact in a cage. But this has devastating consequences for the kiss, for him, and also for the outside world. Luckily, he not only sees the error of his ways, but is granted swift forgiveness by the kind grandma, and all is resolved. Courtney-Tickle illustrates the story with an emphasis on nature and the outdoors. Most of her large double page illustrations are populated with wildflowers, colourful leaves, animals and outdoor activities with a clear focus on weather – all emphasised by the choice of dancing leaves on the book’s endpapers. The colour is magical, reminiscent of David Litchfield, with an old-fashioned fairy tale quality, exemplified by marching bands, an abundance of Snow-White-esque wildlife, cold dark towers, a simplicity in the characters’ timeless outfits. And yet a modernity creeps in too – a wooden bin at the park, mobile phones, an abundance of balloons. The book is about love shared, kindnesses spread, and the empathy needed to understand others. You can buy it here. More love shared in this whimsical picture book from the States, which really is about Valentine’s Day. 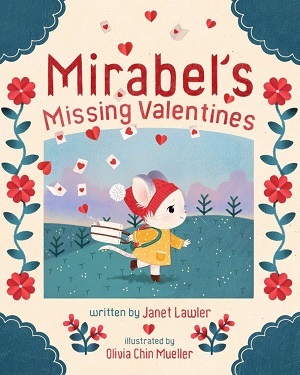 Mirabel, our shy and anxiety-ridden mouse, complete with large eyes, long whiskers and a penchant for hats, sets out for school to deliver her Valentine’s cards. The reader is entreated to rhyming text to tell Mirabel’s story – the joy at creating the cards and the angst about delivering them – but it is only through ‘reading’ the pictures that we see the cards spill from her bag on her way to school. The recipients of the spilled cards (all strangers in the town) return them with smiles, touched by their heartfelt sincerity and the fleeting opportunity to see them, which makes them smile and gives them joy. The happiness she has inadvertently spread gives Mirabel the confidence to take them to school. The illustrations are old-worldly, a cast of anthropomorphic animals fill the book, the buildings look as if they come from a playmobil playset. But if you’re after a picturebook about overcoming anxiety and shyness, and how kindness can spread, this may be one for you. Endearing. You can buy it here. A much more modern outlook in this fresh and zippy tale of friendship that relies heavily upon the reader’s visual understanding as well as narrative absorption. 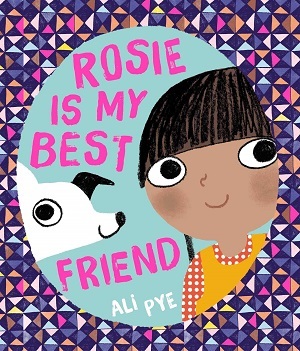 Rosie explores how she spends her day with her best friend – helping the adults around them, playing games, learning new tricks. There’s a delightful contradiction between the helpfulness Rosie and her friend think they are giving, and the actual consequence of some of their actions, and the illustrations not only reveal the truth but burst with friendliness, vibrancy and warmth themselves, from the stroll in the park with balloon seller, boating and games, to the make-believe play at home. There is familiarity in this tale of an ‘everyday’, a comfort from the openness of the characters and the intense cuteness of both girl and dog. The twist at the end is both writerly and masterful – suggesting the reader thinks about point of view and perspective. Clever, witty, and completely adorable. Give it to your Valentine for Valentine’s here.